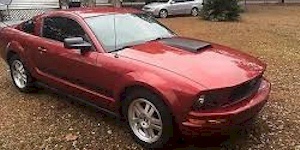 2007 The Mustang V6 Heat Edition is a South Eastern Ford dealerhip special edition from Roush. This version features a flat black hood scoop and hood stripes, flat black side stripes that curve up at the back, a wide flat black Roush spoiler, rear Heat emblem, and a dash plaque with a serial number. Less than 300 of these were built.